Podere Palazzo sits atop a hill with 360 degree views of the complex landscape formed by a unique geological history, Etruscan settlements, and medieval towns with their rich tapestry of cultivated fields. To the east, the lush woods of the Monte Rufeno Regional Park, composed of a mixture of oak, elm and pine trees, descend to the valley of the Tirolle River below. At the southern end of the park are working farms with olive groves and cultivated fields overlooking the valley of the Paglia River. The view to the southeast expands dramatically across the Paglia Valley and the volcanic plateau beyond where the town of Acquapendente and the crater of Bolsena, the largest volcanic lake in Europe, can be seen. The valley is rich with vineyards, olive groves, and sunflower fields, all beautifully framed by the lush vegetation of the plateau. The town of Proceno sits on a tufa rock directly south of Podere Palazzo, surrounded by fields typical of the Alta Tuscia region. To its west is Monte Civetta overlooking the Paglia Valley and the Roman road known as the Cassia, which is still used today as a main thoroughfare. In addition, the Via Francigena, the medieval pilgrimage route connecting Canterbury to Rome and Jerusalem, passes through the valley. Pilgrims still follow this ancient path. Directly west of the house is a nearby hill which offers more cultivated fields and the view of other restored poderi. 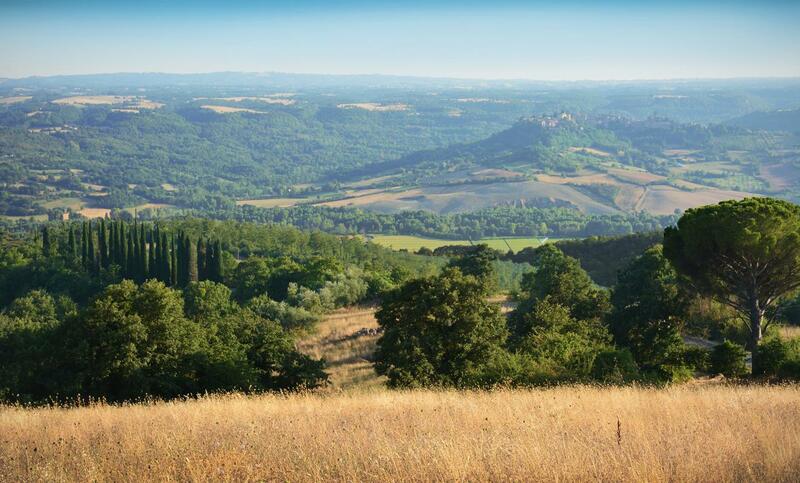 This strategic hilltop was the site of an Etruscan settlement. The views to the north are unique: a picture book valley with stone farmhouses and a system of cultivated fields, pastures and oak woods, topped by the medieval town of Trevinano with Monte Cetona beyond. The serenity of this valley takes you back in time and is so soothing to the eyes that you might just want to sit down to take it all in.